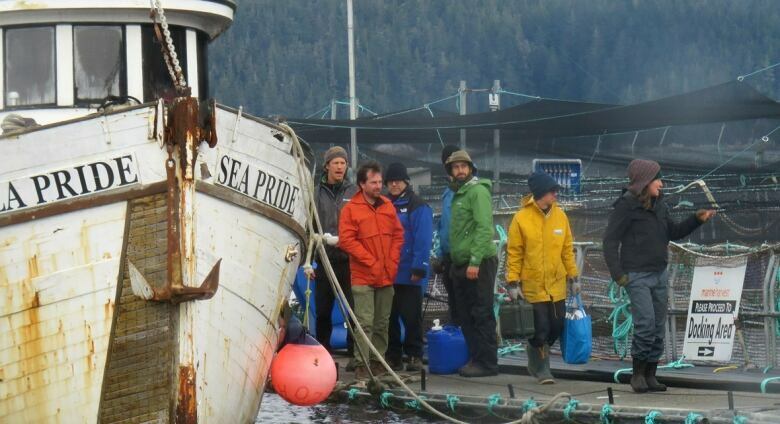 As Washington bans fish farms, First Nations welcome the B.C. government's promise of a 'shared decision-making role' on whether to renew open-net acquaculture tenures in the Broughton Archipelago. The vice-president of the Union of B.C. Indian Chiefs praised Washington state's move to ban fish farms Monday — saying "a perfect mechanism" for this province to follow suit is just a few months away. On Friday, Washington state's senate finalized legislation to end Atlantic salmon farming in net pens off its coast by 2025. Bob Chamberlin, vice-president of the Union of B.C. Indian Chiefs, said the B.C. government committed earlier this year to giving First Nations a say on whether to renew tenures for 18 fish farms that expire in June 2018. "There is a perfect mechanism now for the provincial government to take the appropriate steps to safeguard wild salmon from this one known threat," Chamberlin told On the Island host Gregor Craigie..
Chamberlin said the First Nations with traditional territories in the Broughton Archipelago are close to attaining a formal say in approving fish-farm tenures in the area. Talks with senior B.C. government officials were prompted by fish-farm occupations last fall. "There are five First Nations bands representing six First Nations that have an agreement with the provincial government for a consent-based shared decision-making model based on the UN declaration of the Human Rights of Indigenous People," Chamberlin said. A B.C. government statement issued Jan. 30 confirmed the commitment to "a consent-based government-to-government process," with the First Nations on the issue of fish farm tenures and protecting wild salmon. However, Chamberlin said the First Nations have received no response to a draft document they sent several weeks ago, despite government promises of immediate high-level meetings to negotiate the final process. Aquaculture company Marine Harvest has said it has formal agreements in place with 15 of the 24 nations in the territories where it has aquaculture operations. Chamberlin said that while some coastal First Nations support the aquaculture industry's presence on the coast, they are far from the majority. Many more, he said, rely on Fraser River salmon stocks, which risk disease and sea lice exposure from farmed salmon in the Discovery Channel area near Campbell River on Vancouver Island and the Broughton Archipelago located between northern Vancouver Island and B.C. 's mainland. "There are a number of First Nations that have embraced the industry and certainly that's within their authority to make such a decision," Chamberlin said. "But if the answer 'yes' is to be respected then the answer 'no' must be respected as well."